Get to know “The Specialists’ Specialist”. Dr. John Goosey is nationally board certified, internationally known, and highly respected as a corneal and refractive eye surgeon. For patients looking for the most seasoned and innovative eye surgeons, Dr. Goosey is the laser surgery specialist with vast knowledge and experience. He utilizes various surgical techniques from only the latest advancements in laser technologies and surgical procedures. That is why today, he is one of America’s leading ophthalmologists and a premier LASIK eye surgeons in Houston, having performed well over 30 thousand highly successful operations. In recent years, Dr. Goosey has presented his work on corneal transplantation and refractive surgery, at the World Cornea Congress in Washington, DC, the European Refractive Society in Lisbon, Portugal, the American Academy of Ophthalmology in Chicago, and the Pan American Ophthalmology Congress in Sao Paulo, Brazil. Even more, he has written numerous medical textbook chapters on innovations in corneal transplantation that have proven to be vital resources for the training of resident ophthalmic surgeons and ophthalmic fellows. He trains and speaks around the world, and is a highly sought-after presenter and writer. Before becoming world-renowned, Dr. John Goosey graduated from the Medical University of Charleston, in South Carolina. After graduating with his Medical Degree, he completed a one-year fellowship at the National Institute of Health in Bethesda, Maryland, where he extensively studied the mechanism for cataract formation and treatment. Following this, Dr. Goosey completed a three-year residency at the University of Texas, Department of Ophthalmology in Houston. He completed another fellowship at Louisiana State University Eye Center, where he received his sub-specialty training in corneal and external disease. In 1993, he began studying the use of lasers for the correction of nearsightedness (myopia), farsightedness (hyperopia), and astigmatism. Now, he trains and speaks around the world, and successfully performs LASIK eye surgeries for thousands of patients each year. 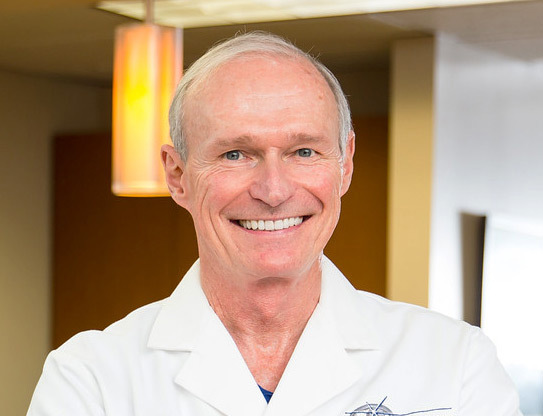 In addition to being board-certified, well-known, and regarded worldwide as a highly skilled eye surgeon, Dr. Goosey remains committed to providing high quality care to all of his patients. His approach to patient care brings his professionalism to a personal level, as he works directly with each patient to ensure that each is fully educated on the ins and outs of the LASIK procedure, cataract surgery, vision correction, or various procedures that pertain to corneal care. Dr. Goosey is at your service. His goal is to successfully diagnose and treat each eye condition with the purpose to restore, preserve, or enhance the eye sight of every individual. His outstanding track record of successful patient care procedures and surgeries is widely known and recognized by his peers. Many fellow doctors have chosen Dr. Goosey to perform their own laser eye surgery, due to his high qualifications, standard of excellence, and history of successful surgeries. Dr. Goosey’s staff team of eye care professionals also make the difference in the lives of patients that visit the office each and every day. This professional office staff also has a proven track record to help back his experience. With them, patients get the absolute best care. Need to speak with someone now? Call 281-407-9062. Dr. Goosey was one of the first eye surgeons in the Houston area (1992) to perform Laser Vision Correction. Dr. Goosey is a Cornea Specialist, Board Certified by the American Board of Ophthalmology. Dr. Goosey was named one of “America’s Best Doctors” of 2013. Dr. Goosey is already one of the most experienced blade-free cataract surgeons in Houston. Dr. Goosey has experience with many kinds of Excimer Lasers. Dr. Goosey was just the second eye surgeon in Houston to proudly offer the WaveLight® FS200 to his patients. Dr. Goosey has evaluated and reviewed the outcome analysis of thousands of treatments. As an accomplished cornea specialist, and after having performed thousands of laser surgery operations, Dr. Goosey has many years of experience diagnosing and treating many types of eye conditions and diseases. He is the premier expert in the Houston area for corneal transplants and refractive surgery. He incorporates all the knowledge of optometry and ophthalmology with enhanced corneal knowledge, surgical experience, and the latest in innovative technology. Dr. Goosey has been performing LASIK® since its inception, which was 2 decades ago. An important reason to choose Dr. Goosey for your LASIK eye surgery is his track record of performing thousands of successful operations. He is a laser vision correction surgical specialist, and has used many types of laser technologies in his practice. Read MD Testimonials. Your Sight. Your Safety. Your Doctor. Schedule Your FREE LASIK Consultation Now! Dr. Goosey uses the WaveLight® Allegretto Wave® EYE-Q Laser, the WaveLight® FS200, and their “Perfect Plus Technology.” This laser is able to treat myopia, hyperopia, and mixed astigmatism. Dr. Goosey uses the most sophisticated equipment available with full FDA approval – the Allegretto Laser and its Perfect Plus technology. The Allegretto Wave® produces the largest available optical zone, virtually eliminating glare and night vision problems associated with older generation lasers. This laser also produces the smoothest corneal surface providing sharper vision and excellent results. Dr. Goosey customizes a LASIK treatment for each patient’s individual prescription and cornea. Then, every 4-6 milliseconds, the eye’s location is measured and the internal mirrors of the Allegretto Wave® are automatically aligned. Right before the pulse is released, a second check is made to confirm that the eye has not moved. The laser tracks your eye four hundred times a second, and can move at a faster rate than your eye could ever possibly move. Ultimately, the clinical results are astounding for the WaveLight® Laser System, and for Dr. Goosey.